Youth Voice Collective sang M People’s Proud in Victoria Tower Gardens, next to the Houses of Parliament, at 2pm on Monday afternoon as part of Channel 4’s online and TV series Battlefront. The programme follows the journey of four young campaigners trying to raise awareness of youth unemployment. In this case, journalism graduate Ava Patel was tasked with organising the choir and getting young people’s voices heard. Ms Patel was unemployed for a year after graduating from Nottingham Trent University. She eventually found work in a call centre and volunteered at Bolton FM, presenting the mid-morning show, to develop her CV. Members of the choir said they thought that young people were seen as “job-shy” and “lazy" by the government. In July the government announced the Youth Contract scheme which offers employers financial incentives for taking on young people and helps companies set up apprenticeship schemes. The government has stated it will invest £126 million over the next three years to support young people aged 16 to 17 who are not in education, employment or training in England. Unemployment rates for 16-24 year olds dropped 0.5 per cent in the first quarter of 2012 (compared with the first quarter of 2011). But the number of young people who have been out of work for over a year has risen 264 per cent in the past year according to a report published by the Trade Union Congress. The choir's performance coincided with the opening of the Conservative Party conference in Birmingham. Choir member and single-mum Kelly El-Hage hopes Battlefront will open ministers’ eyes. “Not all young people are lazy,” she said. “They’re driven and want the chance to go forward. 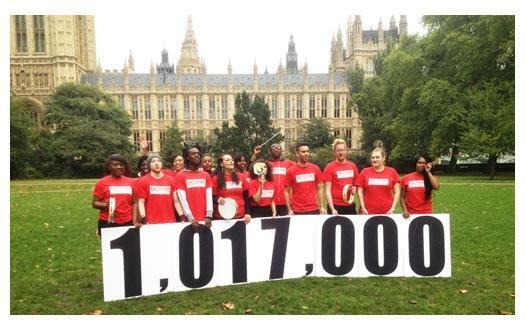 Members of the Youth Voice Connective choir hold placards showing the number of British young people not in employment, education or training (according to figures published by the Institute for Public Policy Research). What job would you like to do when you are older? Do you think that singing is a good way to get people's attention? These young people are singing to raise awareness. Can you think of any other ways they could make their voices heard? Why is it important to tackle youth unemployment? What could the government do to help? Help students prepare for apprenticeship schemes with a detailed resource pack from TESGA. Personal SWOT analysis can really help focus students’ CV writing, this EdComs guide includes this and more on applying for jobs. Calm those interview nerves with this EdComs lesson plan pack on preparing for interviews. Starter activity to make CV writing less daunting for students. The government’s new women’s minister has called for a reduction in the legal time limit for abortions to reflect changes in medical science. Ikea has said it regrets deleting images of women from its catalogue in Saudi Arabia.